BCPL Recruitment 2019 - Walk in for DGM & SM Posts in BCPL, Guwahati, Assam. 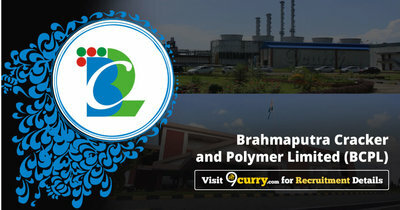 Candidates are invited by Brahmaputra Cracker and Polymer Limited (BCPL) to attend walk-in-interview to be held on 19th & 20 Apr 2019 for 2 vacancies. Bachelor Degree in Engineering* with minimum 55% marks. Preference will be given to candidates having 02 years MBA** with specialization in Materials Management. BCPL Recruitment 2019 - Apply Online for 66 Graduate & Technician Apprentice Posts in BCPL, Across India. Online Applications are invited by Brahmaputra Cracker and Polymer Limited (BCPL) from 08 Mar 2019 to 30 Apr 2019 for 66 vacancies. BCPL Recruitment 2019 - Apply Online for Apply Online/ Offline for Managing Director Post in Department of Personnel & Training, BCPL, New Delhi on Absorption. Online Applications are invited by Brahmaputra Cracker and Polymer Limited (BCPL) from 14 Mar 2019 to 06 May 2019 till 03:00 PM for 1 vacancy.